For instance, both bands originated on islands (ACDC from Australia and U2 from Ireland) and two of their members struggled with alcohol addiction. Unfortunately, drink led to the demise of ACDC’s original lead singer Bon Scott. One night in 1980, after an unusually heavy bender, Scott staggered off to sleep in his car and promptly died of acute alcohol poisoning. Scott’s untimely death when the band were on the cusp of international fame could have destroyed them. Instead, ACDC hit pay-dirt when they hired the brilliant Brian Johnson and went on to release their biggest selling album to date, Back in Black. U2’s Adam Clayton fared better and tackled his 40-year alcohol addiction with a successful visit to rehab. But ACDC’s and U2’s most notable–and hitherto unrecognized–similarity is their predilection for unusual transport choices in their music videos. Several years before Scott’s tragic death, ACDC recorded a video on the back of a truck as it cruised down Swanston Street, one of Melbourne’s main thoroughfares. In those days, Melbourne was a sleepy city of around two million people. And it shows. The 1976 video captures sunny streets remarkably free from traffic and a sparsely populated city center with its relatively few pedestrians looking startled to hear Scott playing the bagpipes and singing ‘It’s a Long Way to the Top’. Five years later, U2 record a video aboard a river barge on an overcast day in a dreary industrial area of Dublin. The mostly teenage audience watch as the band perform while others dance on an overhead pole that looks like a ship’s mast. The video features a strange interlude where Bono and Adam Clayton are walking amidst the teenagers towards the camera. Suddenly, Bono uses an iron bar to pry open a rusty fence and break into some sort of industrial wasteland. In the interim, Adam Clayton, teenage dancers, barge, and all the other band members simply vanish. Have they headed to the pub and neglected to tell Bono? Disappearing barges, audience, and band members aside, both clips are now rather poignant and serve as relics from a less safety-obsessed world where regulations were far more relaxed. It is no longer possible, for instance, to hire trucks and river barges to record videos without first adhering to a mountain of occupational health and safety regulations, all of which would most certainly preclude playing bagpipes on the back of a moving truck and swinging in Bacchanalian bliss atop barge poles. And in ACDC’s case, Swanston Street would be cleared of pedestrians to prevent potential lawsuits and Bon Scott’s bagpipes confiscated as noise pollution. Similarly, U2 would be forced to wear flotation devices in case they fell into the water (particularly if Adam Clayton had been drinking). Not to mention all the Working with Children Checks cast and crew would need, the fines issued to all those teenagers dancing on poles and to Bono and his rusty pipe for breaking and entering. 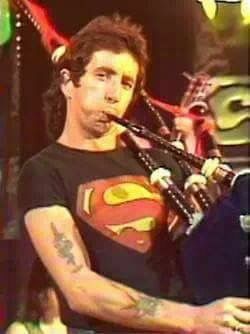 The award for Best Video Featuring Unusual Modes of Transportation goes to ACDC because nobody can beat the sound of Bon Scott playing bagpipes on the back of a moving truck in Swanston Street.